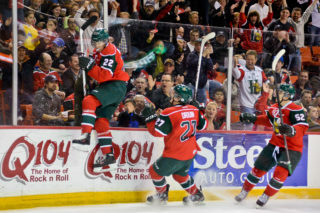 Things are looking very promising for the Halifax Mooseheads in their second round President Cup Playoff Series against Moncton after a 4-2 road win on Tuesday night to open up a 3-games-to-nothing lead, pushing the Wildcats to the brink of elimination. Raphael Lavoie continued to shred the opposition with two more goals, Xavier Parent scored once and Brock McLeod scored the biggest goal of his career with the game-winning tally in the third period. Lavoie’s 13 goals and 20 points lead the QMJHL Playoffs. Alex Gravel was calm between the pipes with a 35 save performance to earn the victory as he out-dueled Francis Leclerc of the Cats who was tagged with the loss again with 33 saves. Halifax has a chance to earn a series sweep on Wednesday night at 7pm when the teams meet again in Moncton. The Mooseheads opened the scoring on the power play when Xavier Parent connected at 4:46 of the first period with assists going to Max Trepanier and Jake Ryczek. Halifax has scored first in all three games of the series and has yet to trail the Wildcats. CHL Player of the Week Raphael Lavoie added to the lead at the 11:28 mark of the first period with a beautiful wrist shot that blew by goalie Francis Leclerc to make it a 2-0 game. Moncton started to push back shortly after the Lavoie tally and finally broke through on their third attempt at a loose puck in front of Alex Gravel with only 2.3 seconds to go in the period. Rookie Jordan Spence picked up his first goal of the playoffs. The teams played a scoreless middle frame but the Wildcats came up with the tying goal 7:56 into the third when Kyle Foreman dug the puck out along the boards and found Christian Huntley who put in a high shot on a screened Alex Gravel which brought an otherwise quiet Avenir Centre crowd to life for the first time in the game. The Moose came up with a push-back of their own led by Joel Bishop’s hard work in the Cats end to create a rebound for the awaiting Brock McLeod who roofed his first of the postseason to regain the lead 3-2 at 11:11 of the third period. Lavoie finished off the scoring with his fifth empty net goal of the playoffs with 55 seconds left on the clock after many of the 4,706 fans had already filtered out of the arena, save for a large contingent of Mooseheads supporters who stood and cheered until the final horn. The Herd had more than 50 fans come up on the first of two sold out bus trips along with many who made the trek across the border in their own vehicles. Moncton was missing a pair of key players due to one-game suspensions. Forward Alexander Khovanov served a suspension for cross checking Joel Bishop across the neck at the end of Game 2, while defenceman Gabriel Sylvestre sat out for an inappropriate gesture. Both will return to the lineup on Wednesday night. The Cats did get veteran defenceman Jonathan Aspirot back in their lineup in the loss for the first time in the series after he was hurt against Baie-Comeau. Lavoie earned the first star nod, Jordan Spence had two points and was named the second star and Brock McLeod took third star honours. 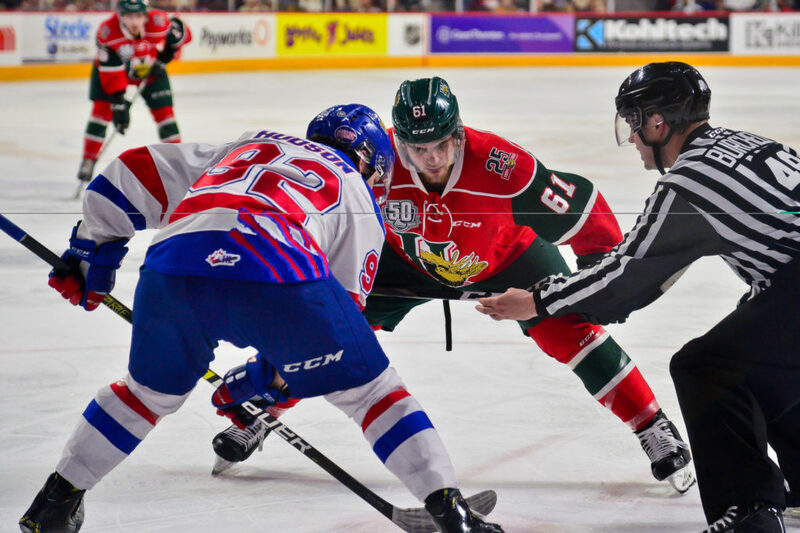 The Mooseheads will be looking to win the series on Wednesday and advance to the third round of the postseason for the first time since Jonathan Drouin and Nikolaj Ehlers led the team to the semi-finals in 2014.